It took months of preparation and weeks of boring meetings with a room full of wannabes and pretenders, whose job is to manage track and field in Jamaica. The agony of listening to respective comments from ‘expert’ advice from these dead weights can only be surpassed by the actual series of events that no one, not even the experts could have foreseen or even predicted. The Jamaican Olympic trails was in all intents and purposes, a complete disaster. Many may not characterize the event as such. They may look at some of the performances and give the track and field weekend a thumbs up. Little Christopher from Calabar going up against the big boys was a track and field enthusiast’s track candy. I agree. Yes it was awesome and so were other accomplishments including the “Return of The Beast” but it was more a test of aptitude for Chris than a match up for salacious fans. The organizers knew what they were doing or wanted to do. Their main goal was to put all their track rabbits headed by their big hares to race in one spectacular track and field festival, pulling out massive crowds, earning lots of money and showcasing to the world the strength and power of the Jamaican sprint factory. Instead the plan exploded and showcased a Jamaican team that is technically undecided. Why? The big hares have all submitted the proverbial sick leaves. 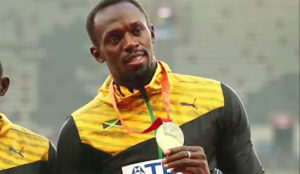 Both in 2008 and 2012, the anchor of Jamaica’s track team was facing similar hick ups weeks before the Olympics. The Big Man was so doubtful the Americans had already called the race. But this time, it’s not just the Big Man but also the Big Girls. Thompson and little Pocket Rocket have also sent in sick leaves. How can that be? Technically speaking Jamaica’s bus to Rio has 4 wheels but no engine. It’s caput and the organizers are now frantically sitting in ‘meetings’ trying to get the bus started. Months of work seemed to have gone down the tube. There is a proverbial saying that states “Man a plan, God a wipe out”. Looking at the past weekend it certainly seems so. But this is where Jamaica’s religious culture should surface and unless the organizers are not good and faithful church goers, their faith should buoy them to the fact that despite the hick ups, Jamaica will be fine. Two times the Big Man has proven his doubters and haters wrong. Oh ye of little faith, like Doubting Thomas they face their Monday evening meeting with trepidation and panic. It’s not just Bolt they will say, it’s our girls as well. But my faith is strong with “DemGirls” as they too are grounded in their faith so Jamaica need not worry. Bolt, Fraser and Thompson are 3 soldiers walking in the battle ground of The Unseen Man. To question the path he wants them to take is questioning the so called religious fever of a country that only cries “Lord Help Me’ whenever it finds it convenient to do so. After 4 days of track and field candy, Jamaica cannot declare a final team for Rio2016. That is a big disappointment for the organizers. Some are already jumping ship declaring Bolt and now the ladies must quote “prove themselves to be fit” so that they can be considered for selection. Did someone just say ” considered” ? Did someone just suggest that the possibility exists that Bolt, Thompson and Fraser will NOT be at Rio because they have to PROVE themselves fit? That sounds as ridiculous as Gatlin declaring the US will take 1,2 and 3 at the Rio 100m. What has been proven this weekend is those so called experts and officials of track and field Jamaica have no faith in their team. It makes you wonder who they stand up for, who do they go in the trenches with? It seems like it’s US and THEM, with US placing hurdles and negatives in the fast track of recovery for our 3 stars. Jamaica’s culture of NO is actively showing its ugly head. The word NO is popular in Jamaica and sadly the “Experts of Track” are the bearers of this nasty culture. Instead of Yes we will succeed and have the strongest team including all three stars it’s….No we cannot wait, No we have to throw them under the bus, No they have to prove themselves, No we have to submit to Olympic pressure, No why rely on those three, No others will do just fine, No it’s not our fault! Doubting Thomas , that’s what they all are. They are as bad for the sport as they are for the team. We will have the team dreams are made of and our boys and girls will produce and do well. The “experts” had better get use to that. Should doubt knock at your doorway, just say to those skeptical, disturbing, rebellious thoughts, I propose to stay with my faith, with the faith of my people and my Team.